Join a 5K Fun Run, Walk or Kids’ Dash on Sunday, June 3 to benefit Conquer Myasthenia Gravis (MG). 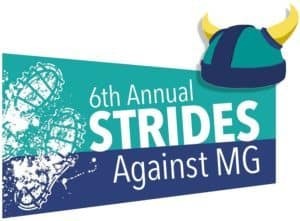 The theme for the 6th Annual Strides Against MG Run/Walk fundraiser is Vikings, so feel free to wear your horned helmets and other Viking accessories. In addition to providing some exercise, this fun, family-friendly event features hula hooping, live music by Peter Jens, bubble blowing, prizes and Viking snacks in Berens Park. All of us at Elmhurst Toyota support the non-profit Conquer MG organization and hope you’ll join us at the Strides Against MG Run/Walk. Registration and check-in for Strides Against MG Run/Walk begins at 7:30 a.m. on June 3. If you haven’t already registered for the Fun Run, don’t worry. There’s still time. Just visit the Conquer MG website at www.myastheniagravis.org/2018-run-walk for forms and additional information. The pre-registration fee is $35 for adults ($40 on the day of the event) and $15 for children under 13. The Fun Run begins at 8:30 a.m. The Kids’ Dash follows at 8:45 a.m. For those who want to participate but do less strenuous exercise, you can choose to join in the one-, two- or three-mile Viking Stroll around the park. Run or walk by yourself, or multiply the fun and get a team of Vikings together. The purpose of the Strides Against MG Run/Walk is to benefit people in Elmhurst and the Chicago area who are battling myasthenia gravis. This rare autoimmune disease strikes about 20 people per 100,000 and can affect all ages and races. The chronic neuromuscular condition causes intermittent muscle weakness and can involve muscles in any area of the body. Conquer MG (known previously as the Myasthenia Gravis Foundation of Illinois) has provided programs such as support, awareness and education to MG patients since 1972. June 3, 2018, 7:30-10:45 a.m. Event check-in and registration: 7:30 a.m. Call 800-888-6208, email info@myastheniagravis.org or visit www.myastheniagravis.org/2018-run-walk.